One of our goals is to experience what a middle class local lifestyle is like in our travels, and the only way that can be done is by spending time in a city. When you tell some people (even Athenians) you are spending 2 months in Athens they look at you like you are crazy, and if we were on vacation or in the summer I suppose we would be. However, when you leave 35 degree ( 2-3 Celsius) of Vienna and all of Europe is under storm clouds, being in Athens in the winter at 60-65 degrees is very nice. Additionally, when you stay over a month in winter the rental price is cut dramatically and the tourists are few. Where we are staying is a beautiful condo on a hill, (that's the tough part) in a nice neighborhood. Since we have been here for 2 months, we were able to do things leisurely - no rushing around to see all the tourist attractions. 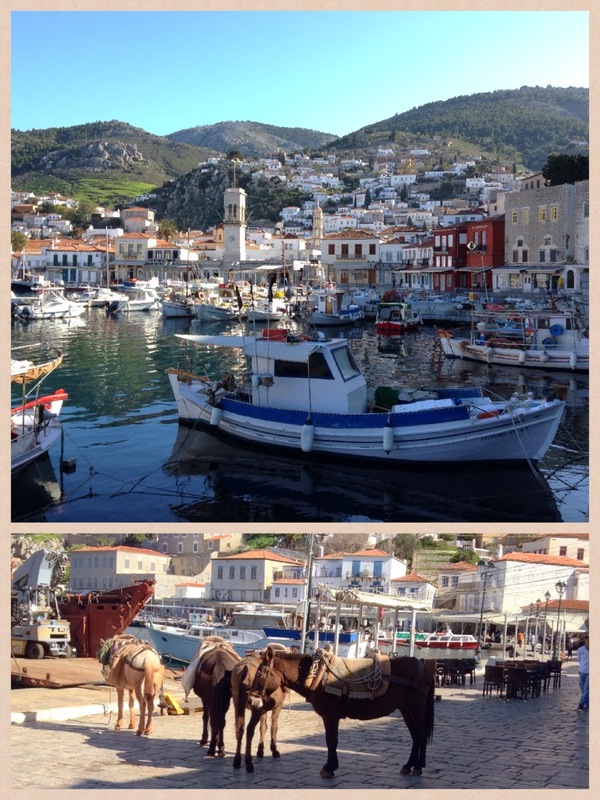 We went to all the museums ( Cycladic, Archeology, Benake ,Byzantine, and others, all very nice), walk the open food markets ( fresh fish is my favorite), and as movie buffs - we still went to the Cinema ( watching American movies with Greek sub-titles, ie. "American Hustle" in Athens is a different experience) which has a 2 for 1 on Wed-Thurs €7 :-) Our daily exercise was spent walking around and exploring parts of the city we would not have been able to do if we were here for a short time. Athens is a perfect spot for over-night trips to Delphi, Peloponnese, Island hopping, Istanbul etc..
To our neighborhood Grocer, Barrista, Gyros King, Restaurants, we have become regulars, not tourists and their help with the language, their smiles and generous nature is a very special part of our journey. 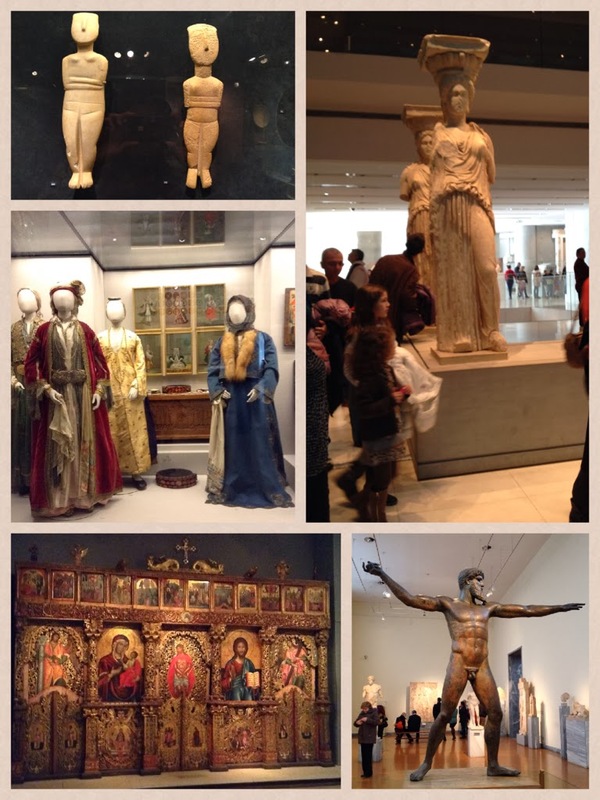 Loved Athen's museums - the city's museums are underrated, what is inside is spectacular. Love everything about olives here! In ancient Greece, the olive tree was sacred and olive oil was the elixir of the gods. 100 different types of olive trees are cultivated in Greece. Trees can live to be over 100 years old with the oldest 1000 years old! Personally, I love the black salty wrinkled olive called Thassos olives, the world famous extra virgin olive oil that was used generously on food, and of course all the olive soaps and creams I packed to take with me! Loved all the fresh food and eating fresh caught fish! It was fun walking the downtown fish and meat markets and hearing the animated selling of what seemed all the same product. ....Love the Islands! Greece has over 2,000 islands. 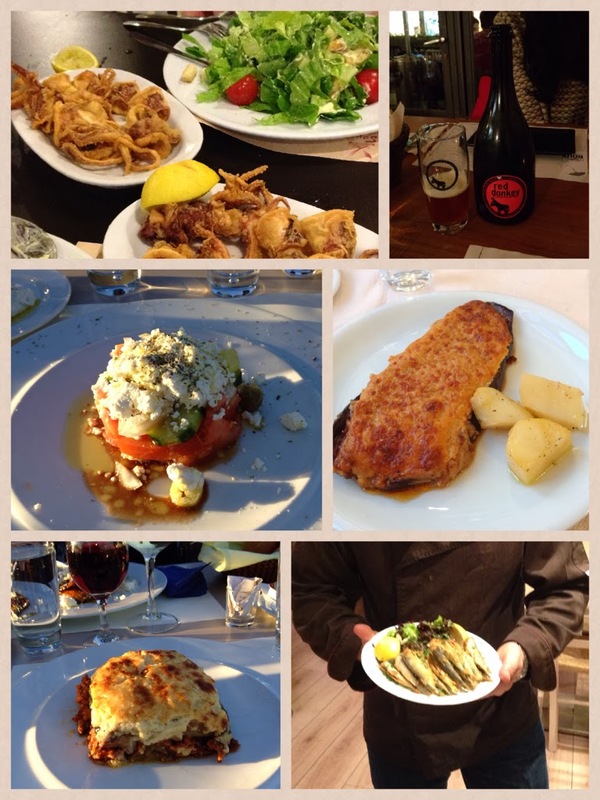 We love the Greek Tavernas - It feels like your own family's restaurant. To quote a modernAuthor/ Philosopher Roman Krznaric "....When we go to a foreign city, we visit the monuments, but the real monuments are the people...putting oneself in someone else's shoes and seeing the world through their eyes...that's the meaning of the journey and the things that open up our minds." Voula our neighbor, always had a smile and a hello and how are you. So kind - when I was sick she brought me soup! Maria is a volunteer that teaches Greek to immigrants and people like us. Greek has been spoken for more than 3,000 years, making it one of the oldest languages in Europe. Named after the goddess Artemis - she made our afternoon cappuccino. She taught us some Greek and we taught her some English. She learned much quicker than we did! 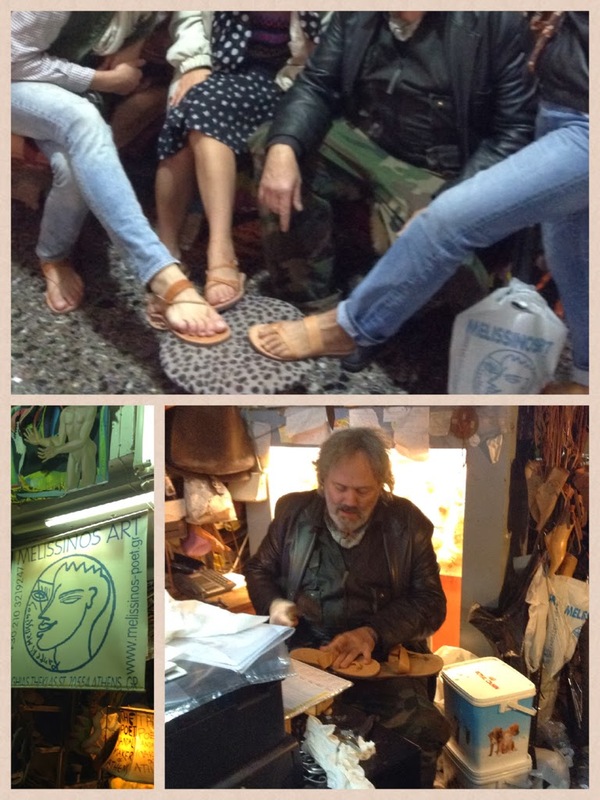 Pantelis Melissinos is a well known artist and a 3rd generation Ancient Greek Sandal Maker. He is crafting our sandals in the picture above. It's one of those things when you visit Greece you better make room in your suitcase for. 30 plus years ago we did the same thing but bought from his Dad! Our neighborhood market vendor taught us how to count out our money when purchasing fresh fruits and vegetables. "Enna, Vio, Tria, Tesora, Pente". We shopped twice a week and more times than not - he would add more to our bags after we gave him an Enna. Greek Yogurt, honey and fruit! The spirit of Greek people and their food. We were invited into the kitchen to watch our lunch being made. Next to the sunset, the best part of our trip to the Island of Poros! George, our neighborhood Taverna owner was so welcoming and generous. He wanted us to try everything he made that day - and of course we did not say no! Nikos and Sandy Karipidis owners of the apartment we rented. Nikos and Sandy took us to dinner where Nikos ordered all his favorite Greek dishes that we tasted for the first time - an amazing treat for us. Highly educated, he gave us our lesson in ancient and modern Greek life over a dinner where the food did not end! No, we didn't solve the problems of today over our meal - Nikos left it as "We Greeks are survivors - we've had the best of times and the worst of times the last 5000 years, we will survive our current problems and come back stronger- we aren't going anywhere." This is the first time I have looked at your blog. You guys are having such an amazing journey! 3 years, really? I see a book coming out of this.